"there is nothing— absolutely nothing— half so much worth doing as simply messing about in boats." Ya know what’s better than drinking rum punch on the beach? Drinking it while on a boat cruising through the Caribbean on an island-hopping excursion. Yes, there were exciting pirate stories and tales of mutiny. Yes, I was worried when the yokels on board started guzzling the imported beer instead of the cheap domestic stuff I’d expected them to drink. Luckily there was enough for everyone (me). And yes, against his better judgment, the captain let me drive the boat for a while (way before the rum punch, of course). Unfortunately, this post is neither pirate-related, nor does it recount the idiotic things our fellow travelers said and did; it's only about lunch. There’s something about swimming that makes most people ravenous, and I don’t think that it’s just related to all those calories you’re burning. The water has some special power that sends your appetite into overdrive, which is why after half a day of swimming, diving off rocks, and snorkeling, it was some of the tastiest chow I’d ever eaten. From a strictly culinary point of view our meal was probably only mediocre, but then you get caught up in the whole experience thing, and the praise just starts flowing. After spending the morning at the Baths in Virgin Gorda, we motored over to Cooper Island for lunch. The crew radioed our orders in, so we were served minutes after arriving at the dock. The one and only restaurant on the island, which is part of the resort there, is cleverly named Cooper Island Beach Club. Aside from the restaurant, you’ll find one local family, a few vacation retreat houses, and quite a few goats on the mile and half long island. No stores, no roads. Here I had the chance to eat some authentic West Indian cuisine, chicken roti, and the not so traditional jerk chicken wrap. 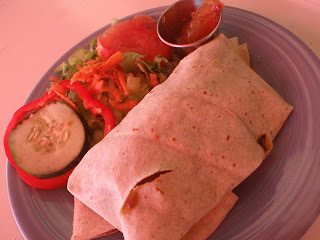 Roti is very similar to a curry, mildly spiced, with potatoes, onion, and chicken, and arrived wrapped in a large flour tortilla. 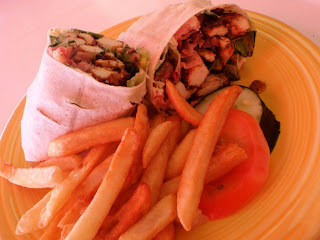 The jerk chicken was spicy and the wrap was stuffed with more bacon than you could shake a stick at. The restaurant is casual, as most people are either staying at the resort, or just stepping off their boats onto the dock, so swim gear is acceptable. The kitchen is open, so you can watch the cooks dish up your food, and of course drinks are available from the tiny bar where you first walk in. This was a first priority for our fellow passengers, who had already made haste in sampling the Heineken as soon as we were underway. (I believe in breakfast beer, but not breakfast binge drinking.) If I’ve talked you into having a meal on secluded Cooper Island, you can stop in for lunch or dinner, or stay at the hotel for a few days (it’s the only one on the island, and I personally think it's a little creepy). Either way, you’ll need a boat or ferry to get there, and that means you’ll probably want some rum punch for the ride. I guarantee it'll be the best ever.